We are currently sitting in the departure lounge of Copenhagen airport, awaiting our transfer to Aberdeen having departed from the Faroe Islands earlier this morning. It has been a busy last few days and we have been rushing to make sure that we have all the material required to conduct our continued analyses. We had a moment of fear and panic when wisps of smoke began appearing from the boot of one of our rental cars. Interestingly, some group members recall this incident differently – with exaggerated versions of the event involving a mushroom cloud of black smoke and the car transforming into a ball of fire. Either way, not to be discouraged, we exchanged our Suzuki (not so) Swift for an even smaller Kia Piccanto. Luckily, the egos of our two media stars had deflated sufficiently since the beginning of the trip, permitting safe carriage in the replacement vehicle. The last two days were filled with glorious sunshine with shades and lotion required. The weather also facilitated a re-negotiation of distant corries and allowed more confident landscape interpretations. However, it remained cool in the shade and Brice was far from impressed when he was encouraged to wash the coring equipment in a lake mantled by a veneer of ice. Our data collection was brought to an end when the equipment was packed away on Saturday evening, the crates weighed down with an impressive number of samples. 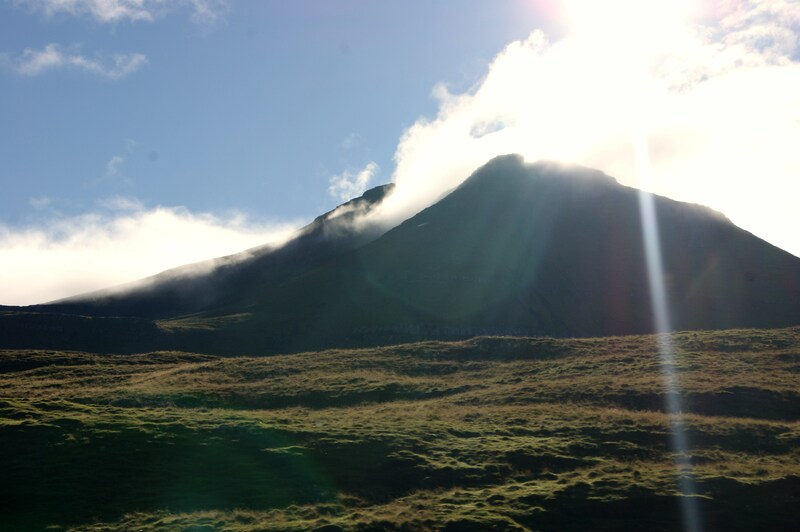 We have enjoyed writing about our Faroese adventure and hope that you have enjoyed reading about it. Farvæl Føroyar og takk fyri hesuferð. You would never believe what we have been doing for the past few days……. hunting down more moraines and coring to greater depths! 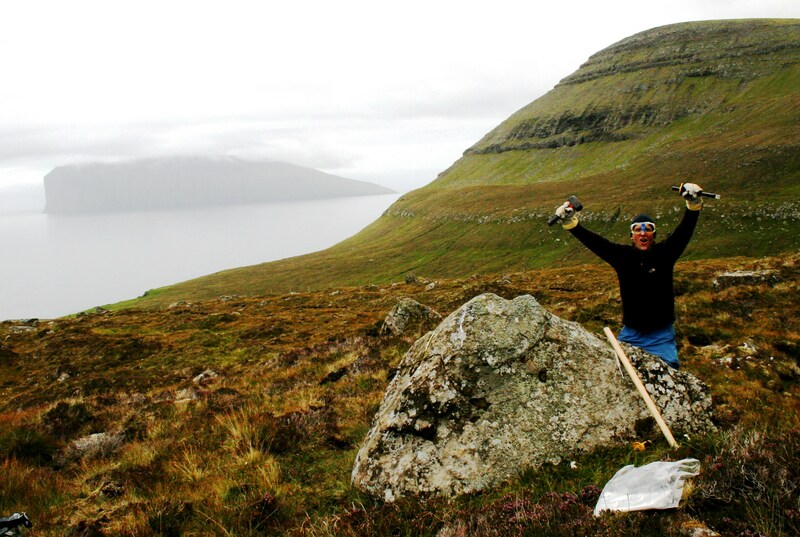 On Tuesday, Brice and Matteo focused on corrie systems to the West and South of Torshavn, mapping and sampling both moraines and erratics. 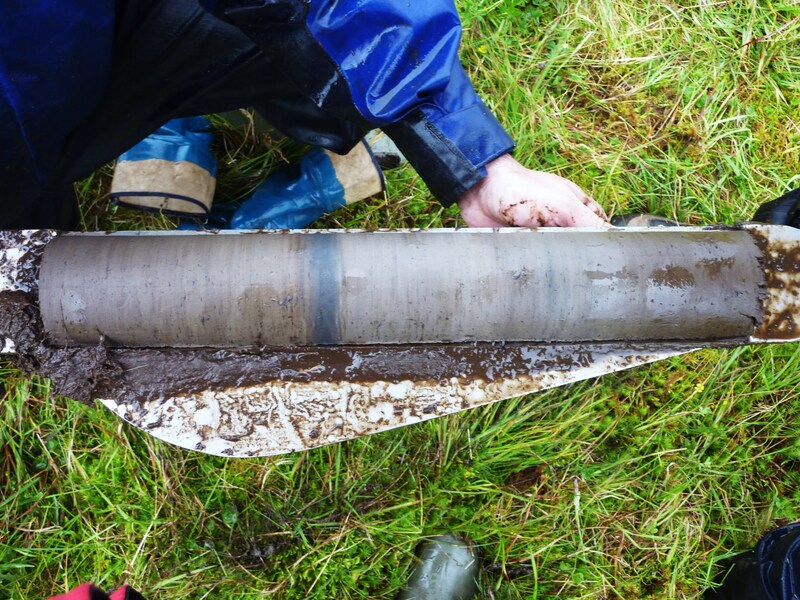 Meanwhile, palaeoecological work revisited a Torshavn bog where borehole investigations revealed a deeper sequence than previously found. The entertainment for the day peaked when we were attacked by a herd of cows while one of us was answering a call of nature. This struck fear into the heart of another team member, prompting an attempted triple salco over an electric fence which proved to be a little too high, thankfully the voltage was low. The day ended with a hearty meal of Faroese lamb and potatoes. Yesterday, the theme of animal attacks continued when Brice and Matteo were attacked by multiple Skuas. However they did manage to find several moraine systems and suitable sampling opportunities for cosmo dating. The palaeoecology group avoided any real danger, but succeeded in getting pretty muddy whilst extracting their deepest sequence yet. Today we have been continuing our investigations around the islands of Streymoy and Esturoy. The dreich weather returneth (if you don’t understand read blog two), and to continue the Scottish theme, hummocky moraine was the focus of the day (more information available upon request). Unfortunately the bogs drew a blank but thankfully the boulders were bountiful! All personnel returned safely and ate a filling meal prepared by our very own Italian chef. The evening diverged with the less cultured among us enjoying after dinner beverages, and the culture vultures enjoying a cinematic masterpiece of Faroese history (“Barbara”). Our plans for the next few days will include investigating some of the more difficult to access corries. Hopefully the bovines and birds will behave themselves. 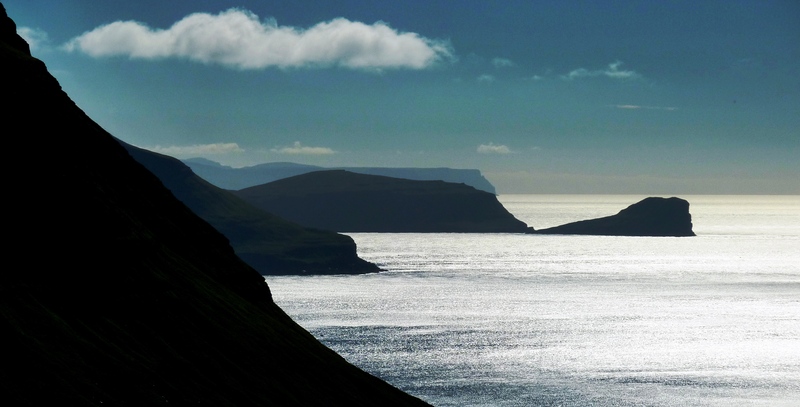 It has been a busy few days here in the Faroe Islands! On Saturday we presented our work to an audience of enthusiastic local earth and environmental scientists. The turn-out was impressive with around 0.1% of the entire Faroese population attending (oh yes!). In the UK this would be equivalent to approximately 600,000 people, however you will be pleased to know we do not have a stadium tour planned anytime soon! Our keynote speakers were delighted to receive gift packs of assorted Faroese beer in recognition of their outstanding (and punctual!) presentations. This was kindly shared with the remainder of the group on Saturday evening, however sadly none remains for colleagues back home. On Sunday, Brice and Matteo took the ferry to Kalsoy to explore a series of impressive corries whilst Kevin and Ed attempted to find Late Glacial sediments in Torshavn. The weather was far from ideal and the work was rather muddy! 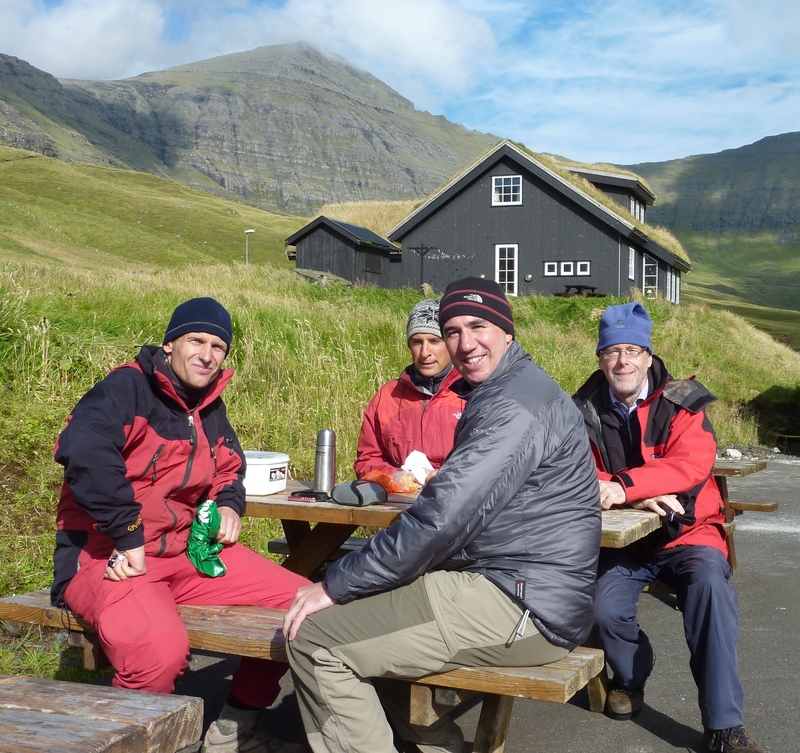 Today, we all visited Suðuroy, the southernmost Faroe Island to search for possible sampling opportunities. 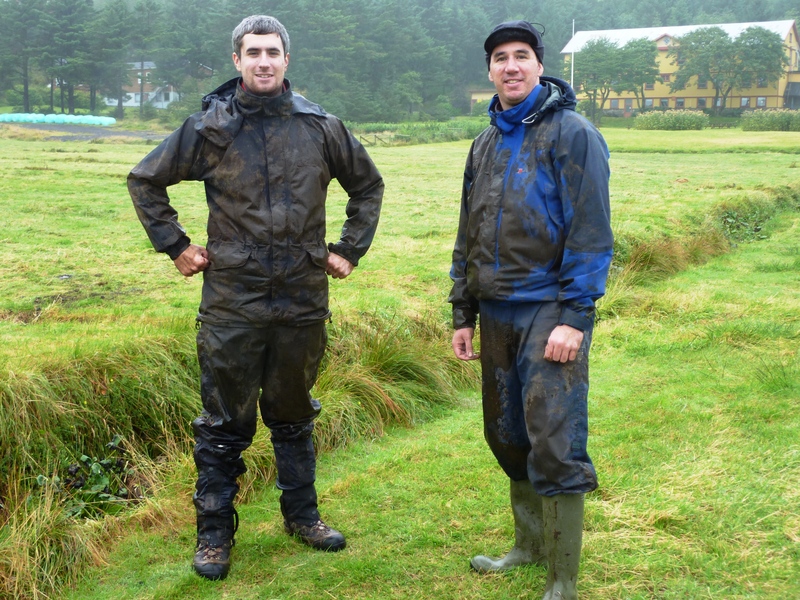 An interesting highlight was the supposed ancient field systems which may have been farmed by some mad Irish monks – ever tried farming on a 60 degree slope? We made it back to Torshavn just in time for dinner where our Italian colleague set the pace towards the nearest eatery. Tomorrow, the quest continues! “Dreich” may be a word of old Scots origin (see: http://www.urbandictionary.com/define.php?term=Dreich%20(Old%20Scots%20origin)), however we feel that it transcends linguistic boundaries and is best placed to describe the conditions encountered today. Not to be discouraged, we set about making the best of our situation and ended up being thoroughly productive. Brice and Matteo mapped the clearest set of moraine ridges yet seen on this trip and collected rock samples for cosmogenic dating. 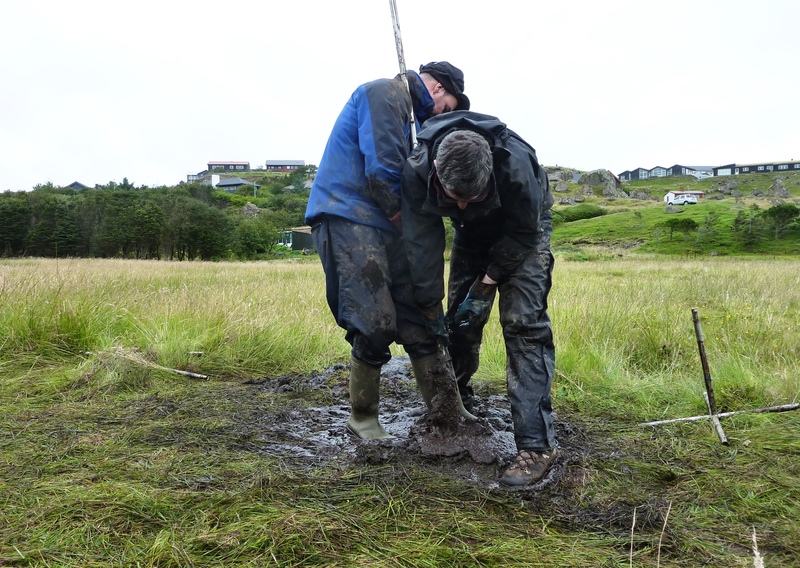 Meanwhile, Kevin and Ed tested the waterproofing of their field gear (unsuccessfully) whilst retrieving a sequence that probably contains the Saksunarvatn tephra horizon, providing a dating control for investigating the palaeoclimate of these islands. After our evening meal, whisky was taken, and a lively discussion ensued regarding which team has the most fun during field work. 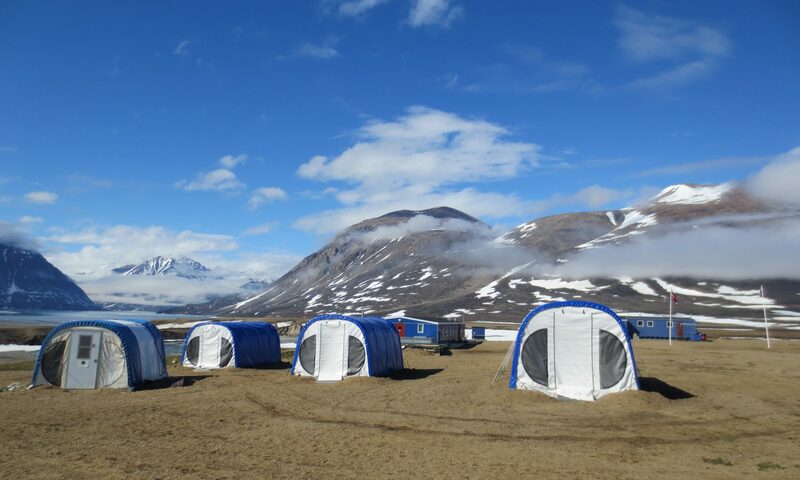 Tomorrow we look forward to presenting our work to a group of local earth and environmental scientists called “GAIA Føroyar”. The question is – should our keynote speakers wear shorts or jeans? 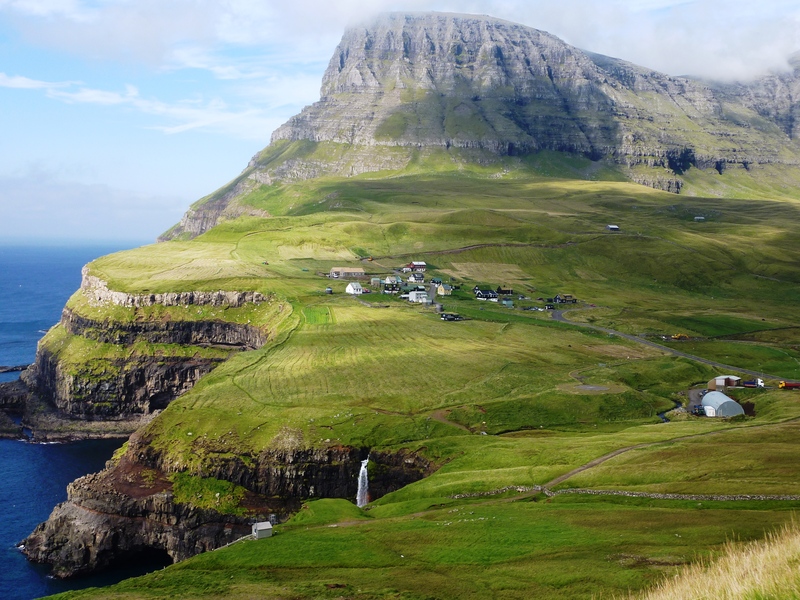 Day one on the Faroe Islands has been a busy one. Our first task was to ensure that our field equipment, which was shipped from Aberdeen two weeks ago, had arrived safely into Tórshavn harbor. After a visit to the customs office and a nervous wait at the shipping agent, we received our box, loaded it into the Suzuki (not so) Swift and returned to our accommodation. The next stop was to Jarðfeingi (The Faroese Earth and Energy directorate) where we met with the INTERACT station manager, Lis Mortensen, to discuss our fieldwork plans for the next two weeks. The meeting was productive and allowed us to consider the work we had planned in the context of local studies that have been conducted previously. 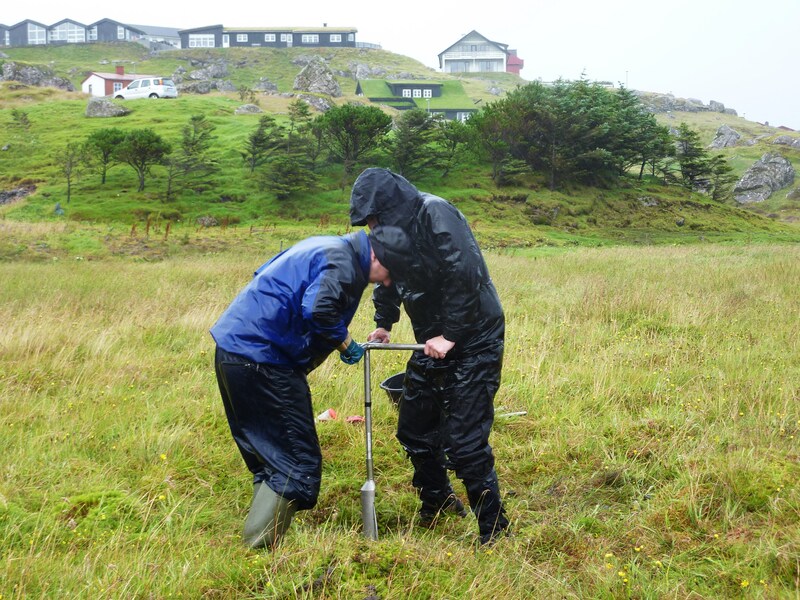 By the time we were finished at Jarðfeingi, word of our arrival on the Islands had clearly spread and we were invited to the local radio station to be interviewed about our work. 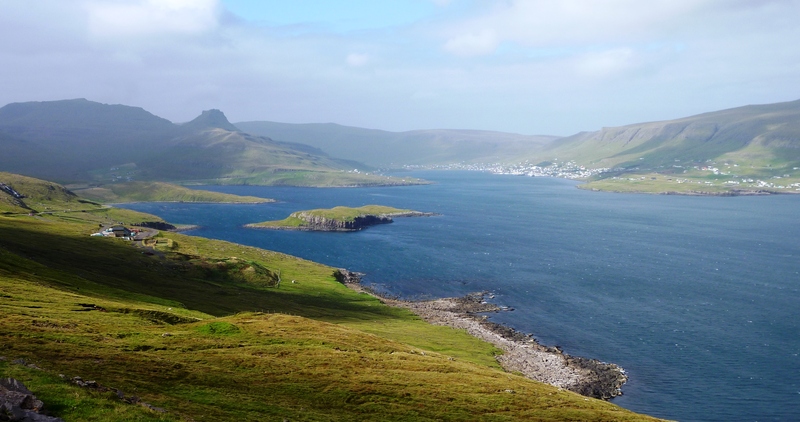 Both Kevin and Brice gave a thorough account of the Faroe Islands’ strategic location for climate dynamics and the potential of the site for further detailed palaeoclimate/palaeoglaciological reconstruction. The media attention was clearly exhausting and we retired back home to reflect on the day’s events and prepare dinner. Tomorrow, the fun really begins and we get to see what this beautiful landscape has to offer.